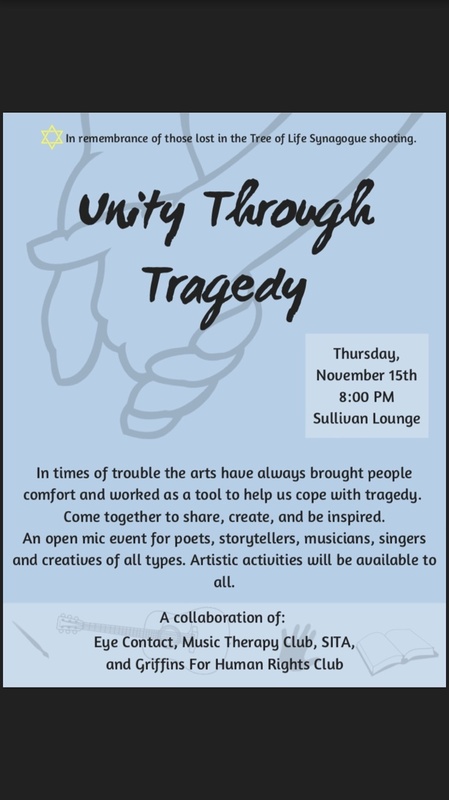 On Nov. 15, Eye Contact, Griffins for Human Rights Club, Students in the Arts and the Music Therapy Club held the Unity Through Tragedy open mic event. The event was open to all students and creative media. Phoebe Walczak, secretary of the Griffins for Human Rights Club, approached Vissat with the idea to turn the normal open mic night to an event that would address the mass shooting at the Tree of Life synagogue. 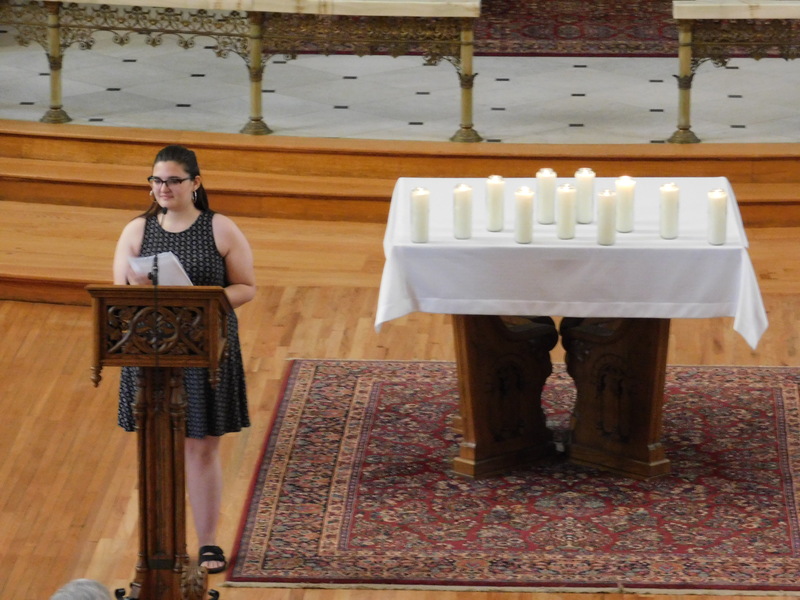 Vissat and Walczak both said they felt it was their duty as Setonians to use the open mic to combat the hatred seen in the surrounding community. On Oct. 27, 11 people were killed during the Sabbath morning service at the Tree of Life synagogue in Pittsburgh. This shooting was the deadliest attack on the Jewish community in the United States. At the event, Walczak read off the names of the 11 deceased victims: Joyce Fienberg, Richard Gottfried, Rose Mallinger, Jerry Rabinowitz, Cecil Rosenthal, David Rosenthal, Bernice Simon, Sylvan Simon, Daniel Stein, Melvin Wax and Irving Younger. Walczak said this was a way to remind everyone of why the community was gathering at the open mic. Students performed using a variety of artistic methods, such as poems and songs. Most followed the theme of unity and reacting to tragedy. Walczak performed a poem entitled, “This is (Not) a Poem.” The poem describes the moments with family that drive Walczak in moments of sadness or tragedy. While the Unity Through Tragedy open mic was the first event to respond to mass shootings this semester, SHU students have held events in response to tragedies before. During the 2018 spring semester, students worked alongside faculty to organize a march for National Walkout Day. The National Walkout Day was in response to the gun violence taking place within schools. Colón said clubs should use their talents and connections to create more educational environments on campus throughout the year. With the upcoming break, clubs have time to prepare new events that pander to the desire of students for more inclusivity themed activities. Walczak said Griffins for Human Rights have already started brainstorming new events to bring to campus to help with connectivity. As a Jewish student at SHU, it was scary being so close to a mass shooting in my religious community. Within hours of the tragedy, members of the SHU community reached out to personally check on me. Maureen O’Brien, the director of campus ministry, was one of the first to contact me. O’Brien not only emailed me, but she also invited me to read at the memorial service for the lives lost at the Tree of Life synagogue. O’Brien took the time to introduce me to every other member of the Jewish community at the memorial service. David Stanger, an associate professor of art at SHU, was one of the first members of the Jewish community that I met at the service. Stanger was very open about his ties to the synagogue and how his family had been processing the tragedy, and he took the time to connect with me and ask about my own feelings. Connecting with members of my religious community within my academic community helped me process the acts of violence that originally seemed impossible to comprehend. The amount of support I received from both students and faculty/staff was crucial in helping me cope with the act of religious terrorism at the Tree of Life synagogue. I will forever be thankful for the SHU community and the allies of the Jewish community that can be found here on campus. ← Midterm elections: What comes next?